MANILA – Japanese rock group ONE OK ROCK is coming to the Philippines for a one-night concert. 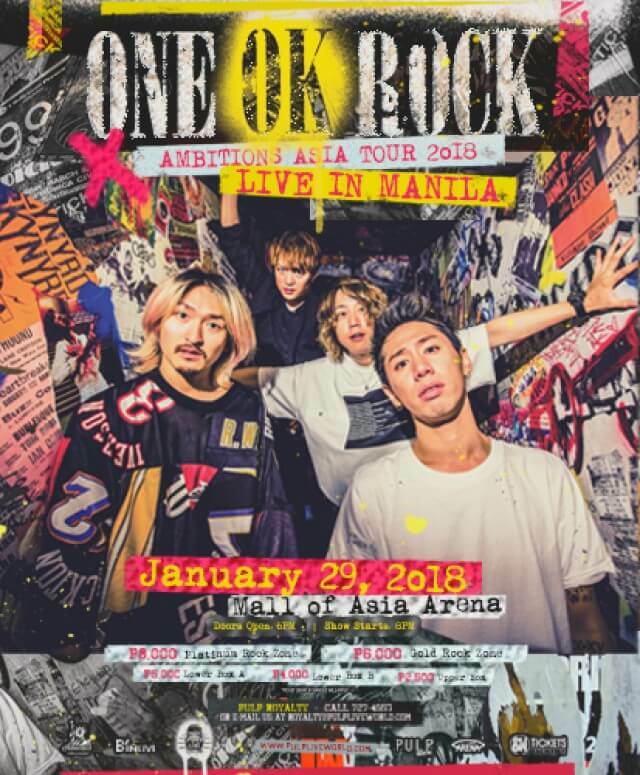 ONE OK ROCK's Manila concert is part of the Asian leg of the group's Ambitions Tour to promote their latest album. It will be held at the Mall of Asia Arena on January 29, 2018. Tickets are priced at P8,480 (Platinum Rock Zone), P6,360 (Gold Rock Zone), P5,300 (Lower Box A), P4,240 (Lower Box B) and P2,650 (Upperbox). Tickets are currently available at all SM Tickets outlets nationwide and online at www.smtickets.com. Aside from the Philippines, the group will also be performing in Thailand, Singapore and Taiwan. Composed of Takahiro Moriuchi, Toru Yamashita, Ryota Kohama and Tomoya Kanki, ONE OK ROCK first performed in Manila in January 2016. The group is known for hits such as "Mighty Long Fall," "Take Me To The Top," "Cry Out" and "Heartache", among others.